SEW KNOT STRESSFUL TO PLAY WITH FIBERS AND WATERCOLOR! 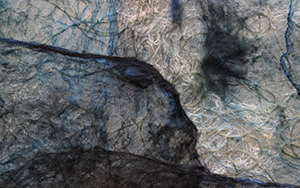 Silk fibers, wool fibers, papers, fabric scraps, unraveled threads, textile hardener, and watercolor provide the foundation for a colorful and tactile experience. Get your hands dirty, don’t be afraid to get messy, and enjoy the experience of colors and textures while creating beautiful art pieces. Materials are provided, but if you are more adventurous, bring glass, metal or ceramic vases, bottles, cookie jars, or any other vessel or shape (not made of plastic). You’ll be amazed at the transformative nature of these materials. Supplies fee is $25. All materials provided except odd shaped containers and aprons. If you have fabric scraps, bring those too.